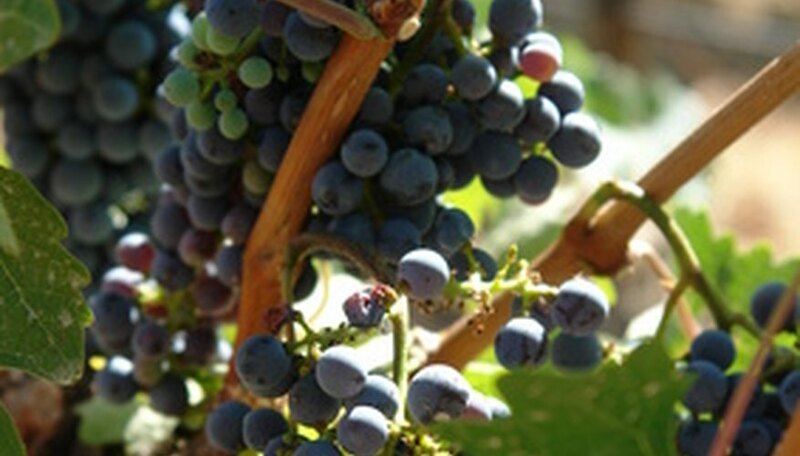 Some varieties of grapes grow well in the heat of a Phoenix summer. Recommended varieties include Flame Seedless, Thompson Seedless and the European types (Vitis vinifera) that can tolerate high heat, according to Phoenix Tropicals. Cane pruning is the best technique for keeping grapevines healthy, controlled and productive. With this method of pruning grapevines, you prune your vines during their dormant season, in fall or winter. You’ll need to identify next year’s fruiting canes and then cut them back to one or two buds, according to Texas A&M University. Cut new grapevines back to one cane—choose the most vigorous-looking cane and cut off all others back to the main stem, using pruning shears. When you prune the best cane, take off all but two buds, according to the Arizona Cooperative Extension. Cut back your selected cane when it grows to about 5 feet long: leave 40 to 50 inches of growth and cut off 10 to 12 inches at its growing tip. This method will encourage the plant to branch out below where you cut it. Cut all but the four most vigorous canes at the top of the vine back to the main stem during its first dormant season. With the four most vigorous canes, leave two buds on each cane—they will produce grapes the following summer. Prune mature grapevines every year during their dormant season. Identify two of the best-looking canes at the top of the vine and two more that grow a bit farther down the stem. Cut these four canes back to 8 to 15 buds. Cut off all other canes to the trunk. Remove the canes that produced fruit when the plant is dormant again. Then select the two best canes at the top of the plant that did not produce fruit this year and two farther down that also did not fruit. Cut them back to 8 to 15 buds and also cut off all other canes to the main trunk. Why Are Our Grapevines Not Producing Fruit?